The 2nd Edition of Oceans of Kansas - A Natural History of the Western Interior Sea will be published in September, 2017. The updated book will be larger, with more figures, descriptions of new discoveries in the past 12 years, and an in depth look at the history of Late Cretaceous paleontology in Kansas. I'm very pleased that the Indiana University Press has given me the opportunity to bring Oceans of Kansas up to date. IMPORTANT NOTE: As mentioned above, this website is now over twenty years old, older than some of its readers. Unfortunately, HTML technology changes rapidly and my old Microsoft FrontPage HTML editor is no longer supported. Worse yet, my two hundred plus web pages cannot be easily translated into a new text editor, and I am too old to start it over - not to mention that my cool digital photos from the early years are not so cool anymore. So the bottom line is that Oceans of Kansas cannot be updated easily, and will eventually fade from the Internet. It has been a wonderful 20 years. 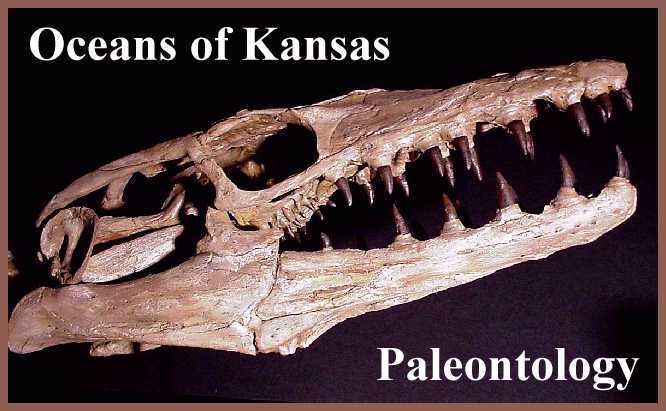 Welcome to the Oceans of Kansas Paleontology web page. 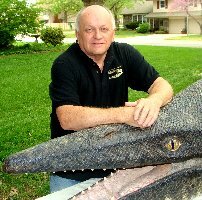 My name is Mike Everhart and I am your host on a virtual journey more than 85 million years "back in time" to observe some of the many strange and wonderful creatures that lived in the oceans of the Earth during the final stages of the Age of Dinosaurs. I have collected fossils from the Smoky Hill Chalk of western Kansas for the last thirty-plus years and have been an Adjunct Curator of Paleontology at the Sternberg Museum of Natural History in Hays, Kansas since 1998. I was twice President (2005 and 2015) of the Kansas Academy of Science, and have served as a co-editor of the Transactions of the Kansas Academy of Science from 2006 through the present (2017). Currently my wife and I are managing editors of the Transactions. The TKAS is one of the oldest science journals in the United States (est. 1872). 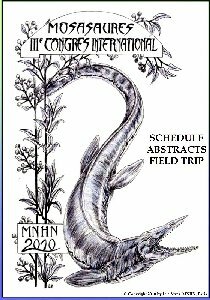 I have conducted a Paleontology Symposium at the past eighteen annual meetings (2000-2017) of the Kansas Academy of Science (Abstracts of the 12th Paleo-symposium (2011) here), and the Second Mosasaur Meeting in May, 2007 (below). 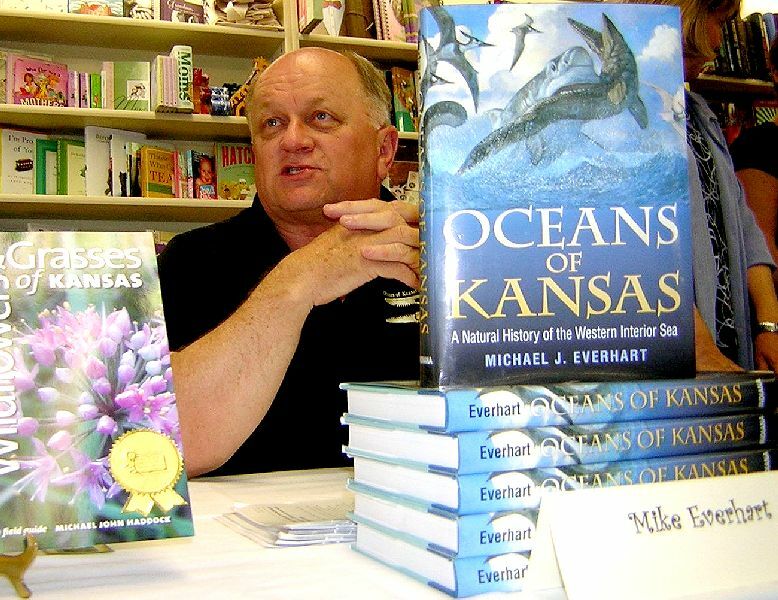 Note that most of the information available on this website is published my 2005 book, Oceans of Kansas - A Natural History of the Western Interior Sea. 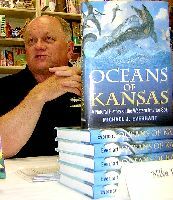 (LEFT) The 2nd Edition of Oceans of Kansas is due to be published by the Indiana University Press in September, 2017. 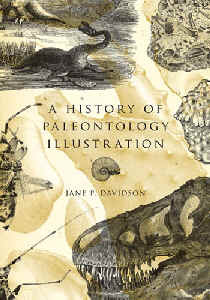 The 2nd Edition is extensively updated and 25% larger than the first edition, with more photos of fossils... and mostly in color. Indiana University Press says, "Oceans of Kansas remains the best and only available book of its type currently available." 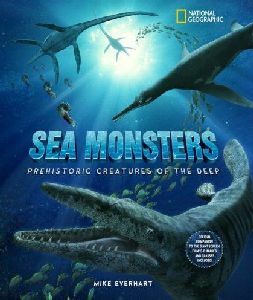 I am also the author of Sea Monsters - Prehistoric Creatures of the Deep, published by National Geographic in 2008. The National Geographic IMAX movie, Sea Monsters, is available on DVD and Blu-ray. LEFT: Tylosaurus was big enough to eat lots of other prey besides fish. One specimen in South Dakota preserves stomach contents that include the bones of another, smaller mosasaur, a marine bird (Hesperornis) and a fish. Copyright © Dan Varner; used with permission of Dan Varner. What Should Everyone Know About Paleontology? - Guest commentary by Thomas R. Holtz, Jr. Although, with one known exception, dinosaurs did not live in Kansas, some of them died and floated into the Western Interior Sea over Kansas. 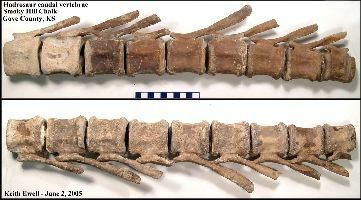 LEFT: An articulated series of nine caudal vertebrae (FHSM VP-15824) in left (upper) and right lateral view from a shark scavenged hadrosaur discovered in the Smoky Hill Chalk of western Kansas by Keith Ewell, June, 2005. 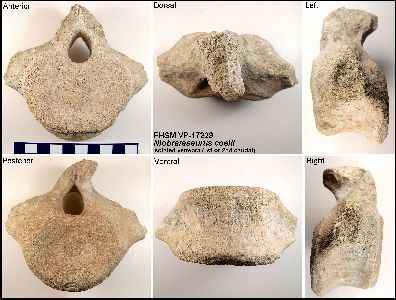 RIGHT: An isolated caudal vertebra from a large Niobrarasaurus coleii (FHSM VP-17229) collected by Laura Garrett in 2007 from southwestern Trego County, KS. 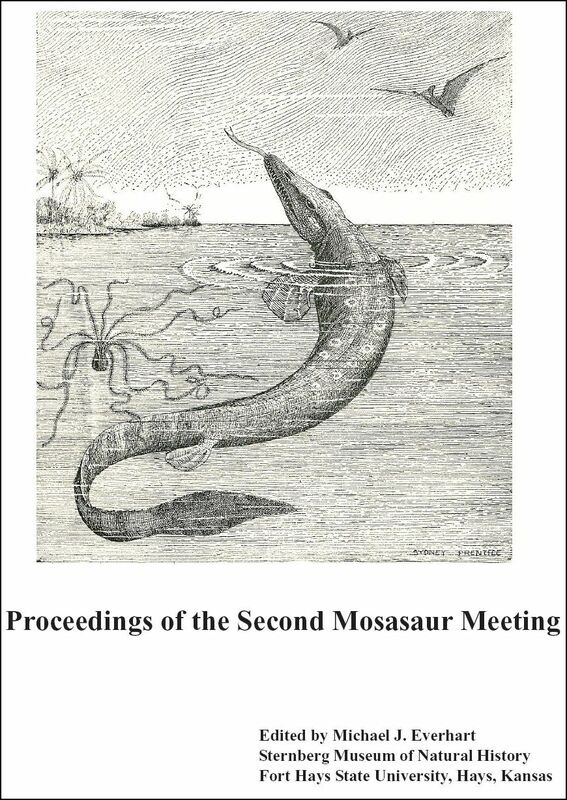 The Second Mosasaur Meeting was held at the Sternberg Museum of Natural History in Hays, Kansas, in May, 2007.
edited by Michael J. Everhart, Sternberg Museum of Natural History, have now been published. Write Brad Penka for more information, Sternberg Museum of Natural History, 3000 Sternberg Drive, Hays, Kansas 67601-2006. NEW Everhart, M.J. 2017. Oceans of Kansas. Natural History Magazine 126(1):29-33. NEW Everhart, M.J. 2017. 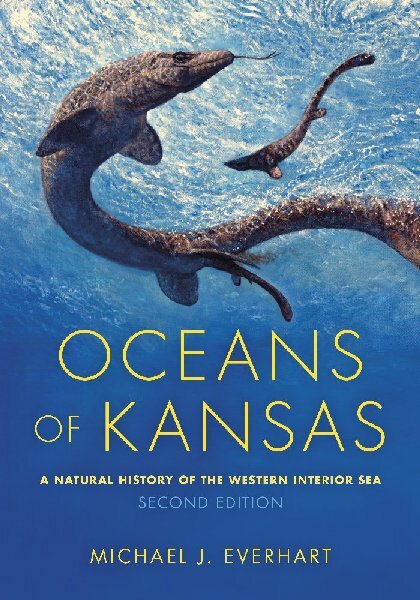 Oceans of Kansas - A Natural History of the Western Interior Sea, 2nd Ed., Indiana University Press, 427 pp. NEW Everhart, M.J. 2017. When the amber waves were blue. Konza Journal 51, 10 pp. NEW Everhart, M.J. 2017. Captain Theophilus H. Turner and the unlikely discovery of Elasmosaurus platyurus. Transactions of the Kansas Academy of Science 120(3-4):233-246. NEW Davidson, J.P. and Everhart, M.J. 2017. Scattered and shattered: A brief history of the early methods of digging, preserving and transporting Kansas fossils. Transactions of the Kansas Academy of Science 120(3-4):247-258. NEW Everhart, M.J. 2017. Joseph Savage (1823-1891): Abolitionist, Kansas pioneer, horticulturist, fossil collector. Transactions of the Kansas Academy of Science 102(1-2):45-56. NEW Everhart, M.J. 2016. William E. Webb – Civil War correspondent, railroad land baron, town founder, Kansas legislator, adventurer, fossil collector, author. Kansas Academy of Science, Transactions 119(2):179-192. Everhart, M.J. 2016. Rare occurrence of a mosasaur (Squamata: Mosasauridae) remains in the Blue Hill Shale (Middle Turonian) of Mitchell County, Kansas. Kansas Academy of Science, Transactions 119(3-4):375-380. Everhart, M.J. 2015. Elias Putnam West (1820-1892) - Lawyer, Attorney General, militia commander, judge, postmaster, archaeologist, and paleontologist. Kansas Academy of Science, Transactions 118(3-4):285-294. Hoganson, J.W., Erickson, J.M. and Everhart, M.J. 2015. Ischyodus rayhaasi (Chimaeroidei; Callorhynchidae) from the Campanian-Maastrichtian Fox Hills of northeastern Colorado, U.S.A. Kansas Academy of Science, Transactions 118(1-2):27-40. Ikejiri, T. and Everhart, M.J. 2015. Notes on the authorship and the holotype of the Late Cretaceous durophagous shark Ptychodus mortoni (Chondrichthyes, Ptychodontidae). pp. 69-73 in Sullivan, R.M. and Lucas, S.G.(eds. ), Fossil Record 4. New Mexico Museum of Natural History and Science Bulletin 67. Everhart, M.J. and Pearson, G. 2014. An isolated squamate dorsal vertebra from the Late Cretaceous Greenhorn Formation of Mitchell County, Kansas. Kansas Academy of Science, Transactions 117(3-4):261-269. OGorman, J.P., Olivero, E.B., Santillana, S. and Everhart, M.J. 2014. Gastroliths associated with an Aristonectes specimen (Plesiosauria, Elasmosauridae), López de Bertodano Formation (upper Maastrichtian) Seymour Island (Is. Marambio), Antarctic Peninsula. Cretaceous Research 50:228-237. Davidson, J.P and Everhart, M.J. 2014. Fictionalized facts; "The Young Fossil Hunters" by Charles H. Sternberg. Kansas Academy of Science, Transactions 117(1-2):41-54. Cook, T.D, Wilson, M.V.H., Murray, A.M., Plint, A.G., Newbrey, M.G. and Everhart, M.J. 2013. A high latitude euselachian assemblage from the early Turonian of Alberta, Canada. Journal of Systematic Palaeontology 11(5):555-587. Everhart, M.J. 2013. A new specimen of the marine turtle, Protostega gigasCope (Cryptodira; Protostegidae), from the Late Cretaceous Smoky Hill Chalk of Western Kansas. Kansas Academy of Science, Transactions 116(1-2):73. Everhart, M.J. 2013. The Palate Bones of a Fish? The First Specimen of Ptychodus mortoni (Chondrichthyes; Elasmobranchii) from Alabama. Bulletin of the Alabama Museum of Natural History 31(1):98-104. Everhart, M.J., Hageman, S.A. and Hoffman, B.L. 2010. Another Sternberg fish-within-a-fish discovery: First report of Ichthyodectes ctenodon (Teleostei; Ichthyodectiformes) with stomach contents. Kansas Academy of Science, Transactions 113(3-4):197-205. Everhart, M. J. 2010. 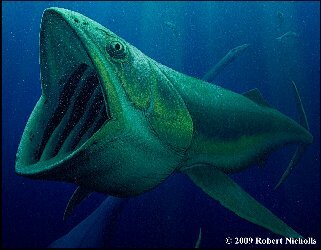 Bonnerichthys gladius – The largest bony fish and first known planktivore from the Late Cretaceous. Kansas Academy of Science, Transactions 113(1-2):123-124 (abstract). Shimada, K., Everhart, M.J., Decker, R. and Decker, P.D. 2009. A new skeletal remain of the durophagous shark, Ptychodus mortoni, from the Upper Cretaceous of North America: an indication of gigantic body size. Cretaceous Research 31(2):249-254. Everhart, M.J. (ed.). 2008. 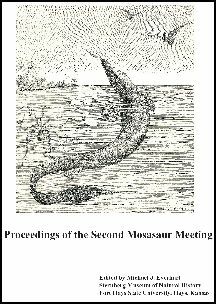 Proceedings of the Second Mosasaur Meeting. Fort Hays Studies Special Issue 3, Fort Hays State University, Hays, Kansas, 172 pp. Oceans of Kansas is NOT about dinosaurs. Although the type specimen of Niobrarasaurus coleii was found in Kansas, this web site has very little information about dinosaurs. 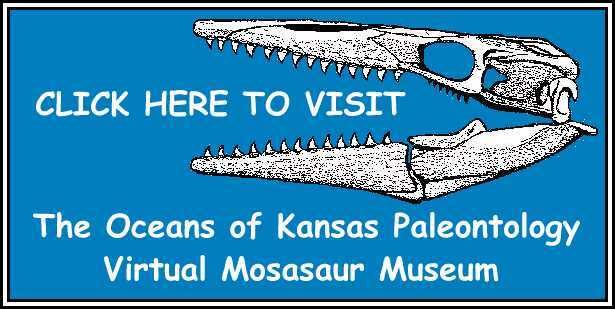 I do recommend some excellent dinosaur sites on the Oceans of Kansas Linkspage. 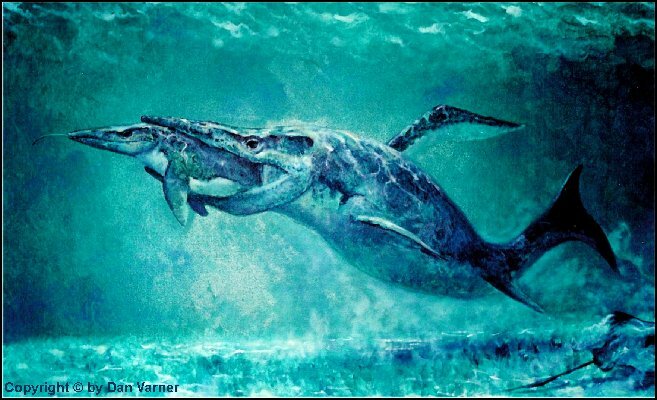 For more information about the origin of mosasaur and plesiosaur names, go to Ben Creisler's Translation and Pronunciation Guide, a recent addition to the The Dinosauria On-Line Dinosaur Omnipedia. John Damuth's Bibliography of Fossil Vertebrates (BFV) is HERE. 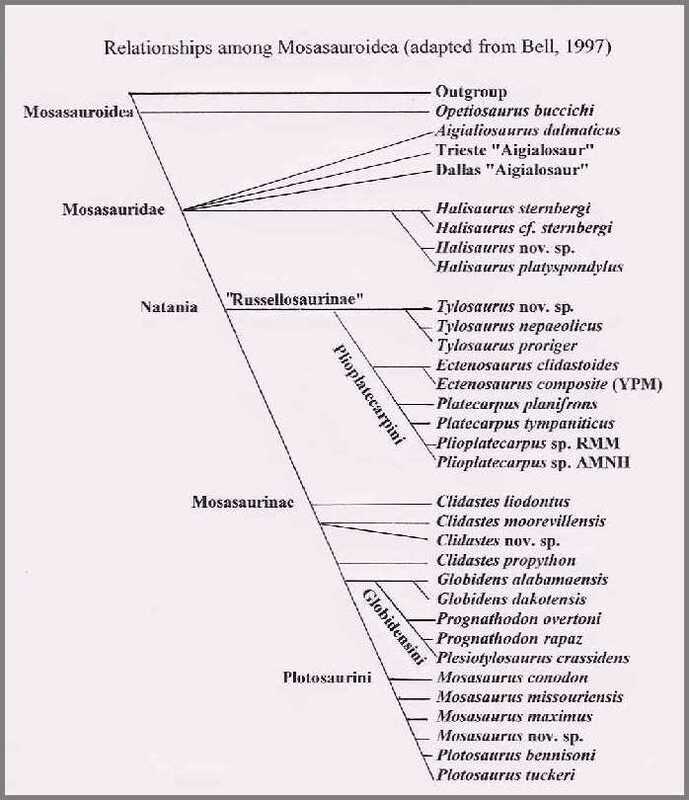 Click here for the most current view on the relationships of American mosasaurs. Also go HERE for a more detailed cladogram on Mikko Haaramo's Phylogeny Archive webpage. 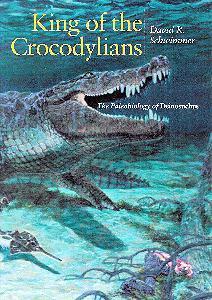 For a fictional story about the daily life of a mosasaur, CLICK HERE. 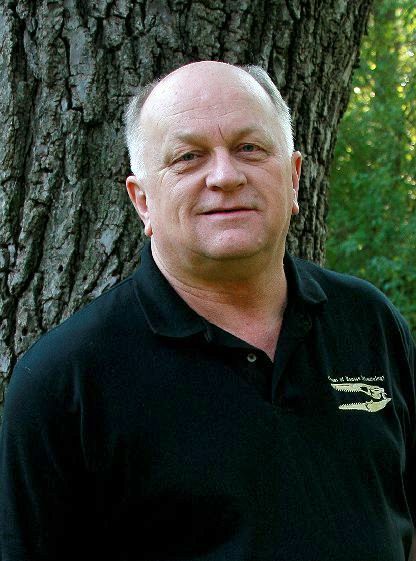 If you are interested in fossil insects, visit Roy Beckemeyer's "Winds of Kansas" webpage. Can you identify these tiny teeth? Mystery skull - Can you identify it? Invertebrate feeding traces on shark teeth? "The best publication about mosasaurs"
The Yale Peabody Museum Publications Office is pleased to announce that the 1967 monograph, "Systematics and Morphology of American Mosasaurs" by Dale Russell, Peabody Museum of Natural History, Yale University, Bulletin 23, is now available as a facsimile reprint through the Yale Peabody Museum web site. The museum regularly receives requests for this title, which is the first of several of out-of-print publications that will be made available to the worldwide academic community through Yale's print-on-demand service. (Go to the Publications link at http://www.peabody.yale.edu). 09/13/2008 Digging up a large turtle in the Fairport Chalk - Probable first collection of the skull of Desmatochelys lowii from Kansas. 07/13/2008 First polycotylid plesiosaur from the Fort Hays Limestone - (Early Coniacian) - Jewell County, Kansas. 04/27/2008 Baptornis advenus Marsh 1877, a marine bird from the western Interior Sea. (Smaller, more primitive than Hesperornis. You can now download a FREE pdf copy of this early article on Kansas Sharks by Williston - Provided by the Kansas Geological Survey. Williston, S. W. 1900. Cretaceous fishes: Selachians and Pycnodonts. University Geological Survey Kansas VI pp. 237-256, with pls. The Cretaceous Period lasted from about 144 million years ago to 65 million years ago. In Kansas, it is represented by marine and estuarine deposits from the Early Cretaceous (Albian) Cheyenne Sandstone and Kiowa Shale that overlay the Wellington Formation (Permian) or the Morrison Formation (Jurassic) at the base, to the Pierre Shale at the top. (See Kansas Geology Map and Time Scale). A brief Cretaceous Time Scale is found here. The 1999 version of the GSA (Geological Society of America) geologic time scale is found HERE as a printable .pdf file (233 kb). A major part of the upper portion (Late Cretaceous) of these deposits is referred to as the Niobrara Formation. 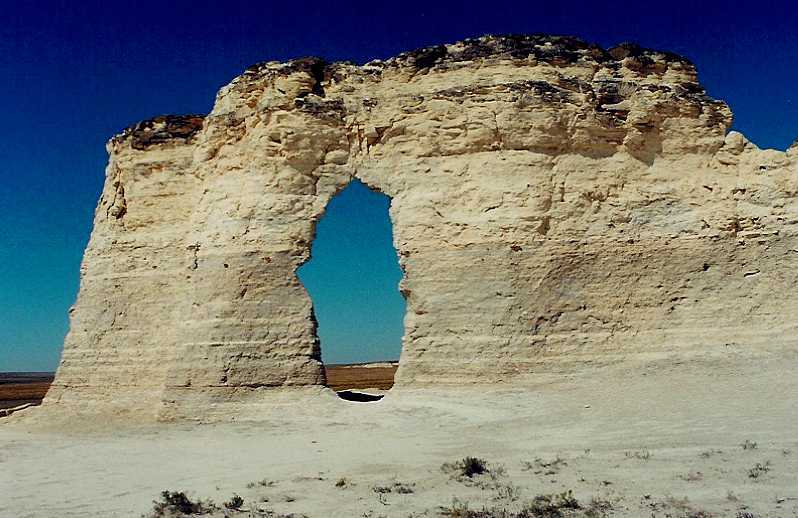 It contains a rather unique member called the Smoky Hill Chalk, and provides the exposures for two Kansas landmarks: Castle Rock and Monument Rocks. The chalk found in Kansas was deposited between 87 and 82 million years ago during a period when a shallow inland sea (the Western Interior Sea) covered most of the Midwest from the Gulf of Mexico to the Arctic Circle. The deposition of these chalky, marine sediments occurred during the last half of the Cretaceous Period, approximately 15-20 million years before the end of the Age of Dinosaurs. 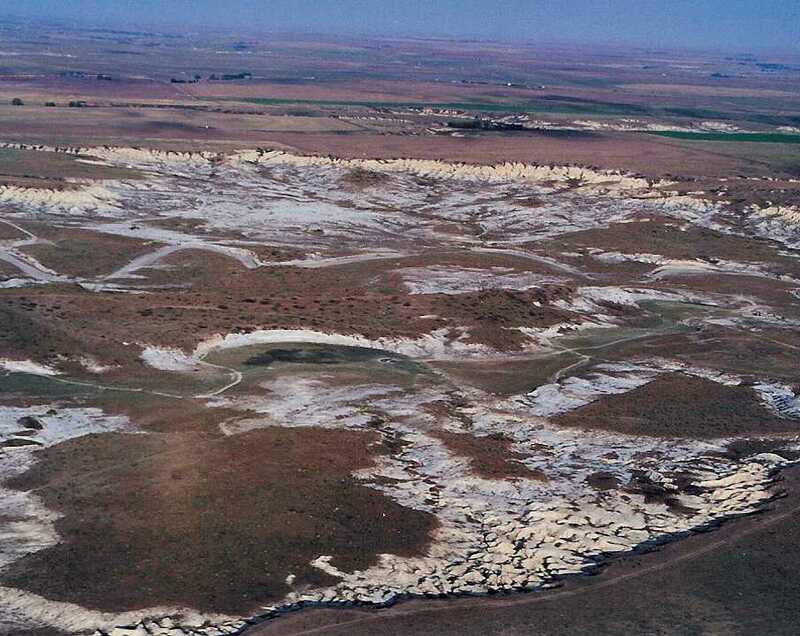 The Smoky Hill Chalk member is about 600 feet thick in Kansas, and lies conformably above the Fort Hays Limestone, and below the Pierre Shale. For the most part, the chalk is composed of the compacted shells (coccolithophores) and plates (coccoliths) of an abundant, microscopic, golden-brown algae (Chrysophyceae) that lived in the clear waters of a warm, shallow sea. A large percentage of the chalk is made up of coprolites containing coccoliths from the animals that fed on the algae. More photos of the Smoky Hill Chalk HERE. The Western Interior Sea,sometimes called the Inland Sea, was probably less than 600 feet deep in most areas, and had a relatively flat and soft, mud bottom. It is considered to be an 'epi-continental sea'; that is, one which lies on top of a continental landmass, and not between continents. Near the middle of the sea where Kansas is now located, sediments were deposited at a rate which would ultimately produce about one inch of compacted chalk for every 700 years. The chalk also has more than a hundred thin layers of bentonite clay, most of which are rusty red in color, that are the result of the fall of ash from repeated eruptions of volcanoes to the west of Kansas in what is now Nevada and Utah. These ash deposits can be traced for miles across the chalk beds and have been used as marker units in describing the stratigraphy of the formation (See Hattin, 1982). In addition, several species of vertebrate and invertebrate marine life that lived and/or became extinct at certain times during the deposition of the chalk are useful in determining the age and biostratigraphy of widely separated exposures (See Stewart, 1990). 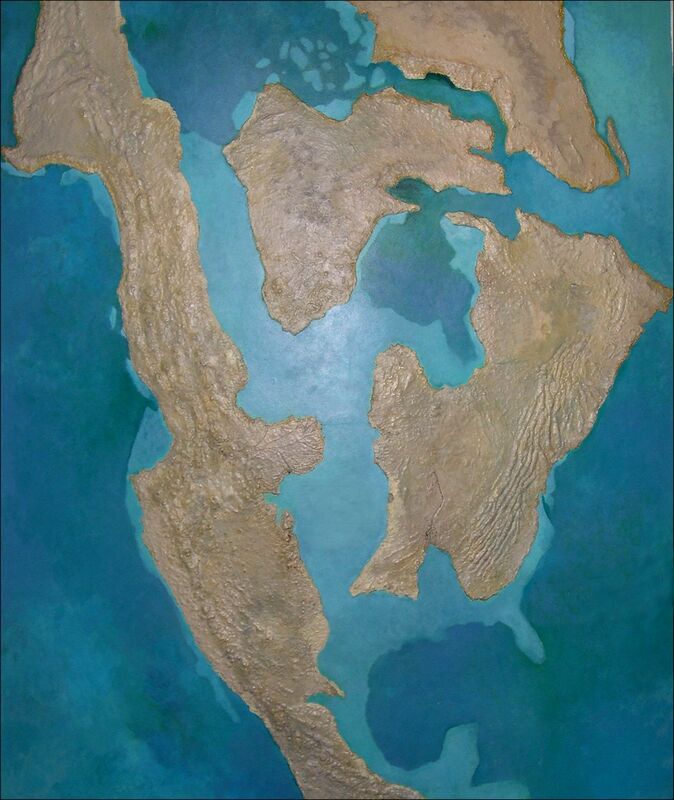 Near the end of the Cretaceous, the Western Interior Sea began to close, becoming shallower and narrower as the Rocky Mountains were pushed up from the west, uplifting the sea bottom as they rose. Eventually, the center of North America rose above sea level and the sediments (limestones, sandstones, shales and chalk) deposited on the basement rocks of Kansas for nearly half a billion years began to erode away. 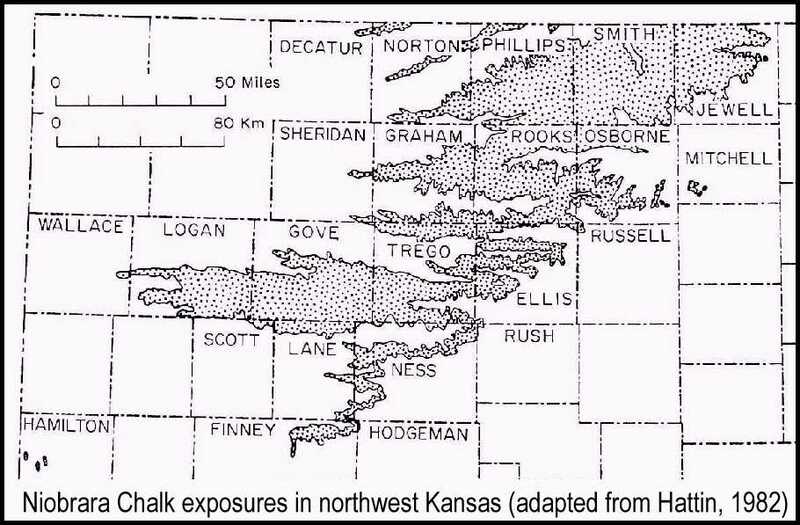 A map of Kansas showing the surface and sub-surface distribution of the remaining Cretaceous rocks (adapted from the Kansas Geological Survey Bulletin 162; 1963). Although Kansas was once nearly covered with Cretaceous marine deposits, millions of years of erosion have removed a large portion of them them from the surface, leaving many areas of chalk exposed along river valleys in the northwest portion of the State. Go here for more information on Kansas Geology. 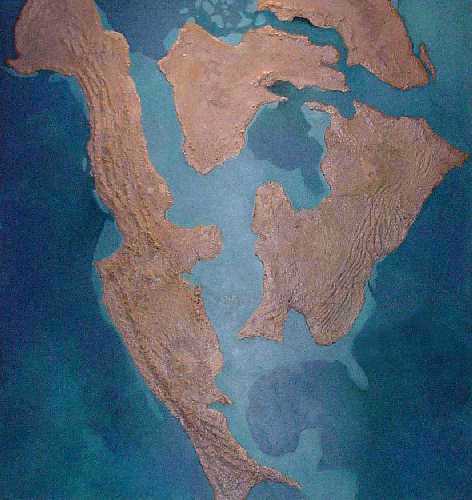 This shallow ocean was home to a variety of marine animals, almost all of which are now extinct. These included giant clams, rudists, crinoids, squid, ammonites, numerous sharks and bony fish,turtles, plesiosaurs, mosasaurs , Pteranodons and even several species of marine (toothed) birds. 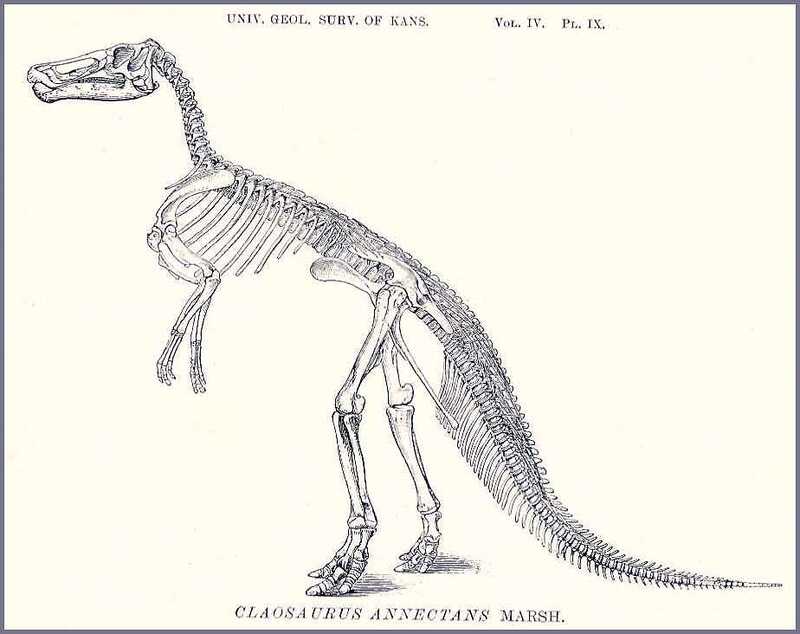 Although it seems unlikely that you would find dinosaur fossils in the middle of the Western Interior Sea, a number of them (a hadrosaur found by O. C. Marsh in 1871, and several nodosaurs, includingthe type specimen of Niobrarasaurus coleii) have been collected from the Smoky Hill Chalk, and their remains have been well documented. 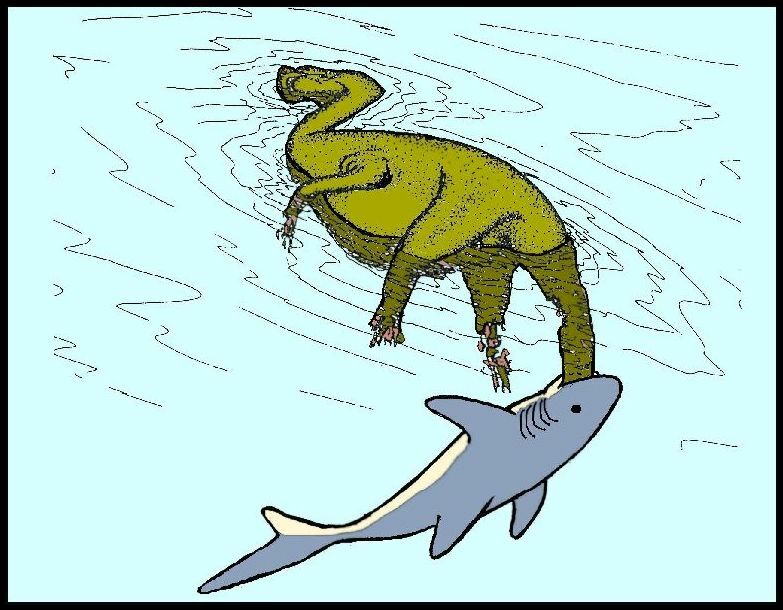 The bodies of these dinosaurs must have somehow floated hundreds of miles into the sea before sinking to the bottom or being torn apart by scavenging sharks. It is possible that they died during catastrophic flooding on the land masses to the east or west, and were carried out to sea on a large, tangled mat of trees and other vegetation (fossilized wood, including large logs, is also known from the chalk). Over a period of about five million of years, the remains of many of these animals were preserved as fossils in the soft, chalky mud of the sea bottom. When this mud was compressed under thousands of feet overlying shale, it became a deposit of chalk that is more than 600 feet thick in Western Kansas. 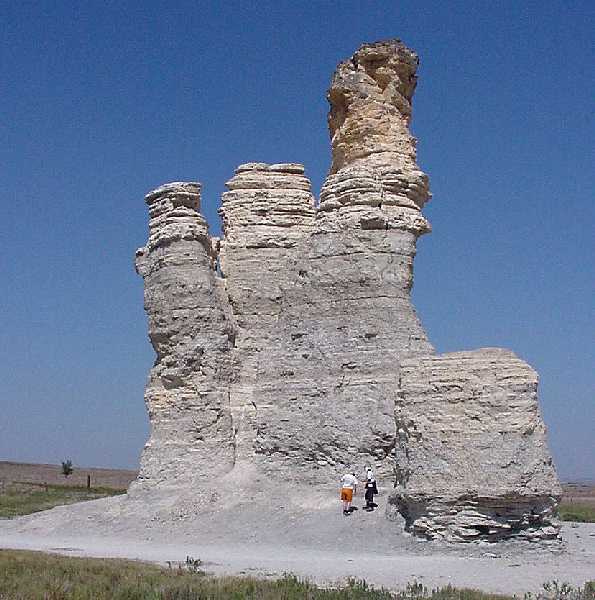 Most of the massive chalk formation that once covered Kansas, however, has been eroded away over the last 60 million years and is now exposed only in a relatively small area in the northwestern corner of the State. This part of Kansas is also known as the Smoky Hills. Since 1868 and the discovery of Tylosaurus proriger, the Smoky Hill Chalk has been the source of thousands of fossil specimens, many of which are on exhibit today in museums around the world. 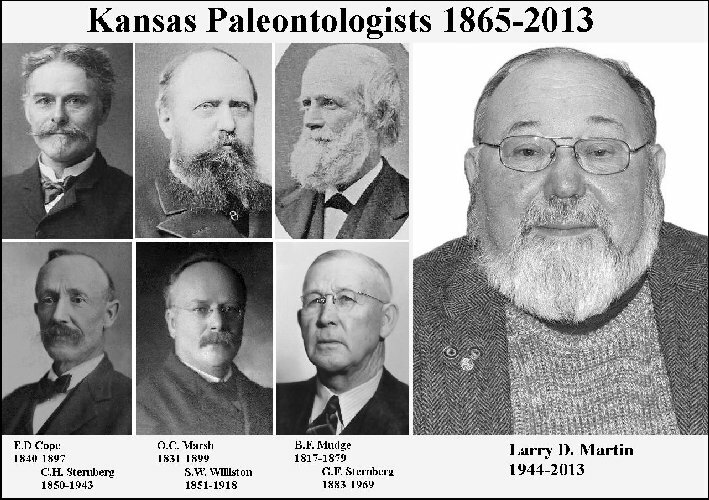 The first significant collections of Kansas fossils were made by relatively unknown scientists like Professor Benjamin F. Mudge, Dr. George M. Sternberg, Dr. John Janeway, and Dr. Theophilus H. Turner. Many others were collected by and for such famous paleontologists as Edward Drinker Cope, O. C. Marsh, Samuel W. Williston, and Charles Sternberg, (for more information on the Sternberg family, click here), including a large portion of the Yale Peabody Museum collection that resulted from the Yale College Scientific Expeditions of the 1870s. For some 'old time' advice on collecting fossils, see an 1884 article by Charles H. Sternberg here. Much of the early work on mosasaurs in Kansas was published in The University Geological Survey of Kansas in the late 1890's. A large number have been found since then by amateur collectors and many of these have been significant additions to paleontology. The Sternberg Museum of Natural History at Fort Hays State University, the Museum of Natural History at The University of Kansas, and the University of Nebraska State Museum have excellent collections of fossils from the Smoky Hill Chalk. The Denver Museum of Nature and Science, the Sam Noble Museum of Natural History in Norman, Oklahoma, the Field Museum of Natural History in Chicago, the Philadelphia Academy of Natural Sciences, and the American Museum of Natural History also have many Kansas fossils. Click here for additional information about some early American paleontologists. Oceans of Kansas is now available as a book. OCEANS OF KANSAS - A Natural History of the Western Interior Sea. by Michael J. Everhart, published June, 2005 by the Indiana University Press ISBN: 0253345472 "A journey to a time when sea monsters roamed the middle of America"
In Memoriam: Dale Allan Pulliam, 1946-1967, U.S.M.C.